Expandable ,non-kink ,durable ,leakproof ,easy to store, easy to use. A USEFUL GIFT for gardeners. Save Time and Money, Enjoy Garden Watering -- Begleri Garden Hose is one of the most advance garden hose on the market. Expandable ,non-kink ,durable ,leakproof ,easy to store, easy to use, it is a USEFUL GIFT for gardeners. 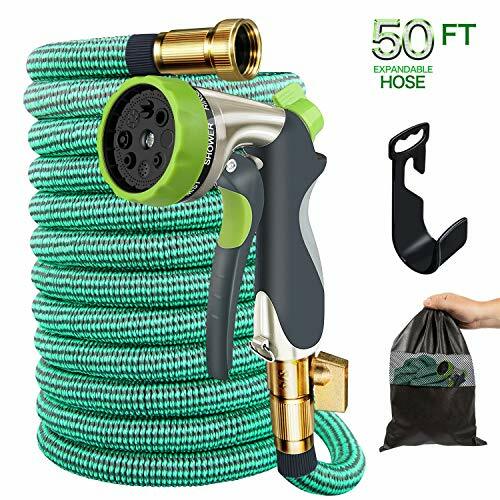 Portable & Expandable -- Flexible Garden hose starts out 17 feet and expands to 50 feet with water pressure, and returns in seconds to 17 feet after water is out. Flexible latex tube & lightweight strong fabric prevent tear, cracks or leak. Stronger & More Durable -- Ordinary water hose operating water pressure 43.5-87 psi/3-6Bar, Begleri garden hose can safely operate with water pressure up to 145 psi /10 Bar, and operating temperatures of 41℉-113℉. Included with your Begleri Hose is a high-quality, 8-pattern rotatable metal spary nozzle, wide range of uses for watering plants, clean garden or pool, shower pets or wash car,with solid brass fittings, excellent rust-free and durable quality, leakproof, use it with confidence and comfortable every day ! Lifetime Replacement GUARANTEE -- We're so confident in our garden hose, so we're offer Lifetime replacement guarantee for you. If you ever have any issues with your Begleri, simply contact us and we'll offer a new absolutely free or refund your payment in full ASAP. If you have any questions about this product by Begleri, contact us by completing and submitting the form below. If you are looking for a specif part number, please include it with your message.